Article first published as Book Review: ‘Sorrows & Songs, One Lifetime – Many Lives’ by Janice Wood Wetzel on Blogcritics. 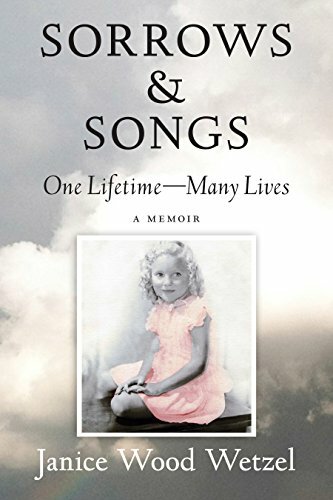 As a fan of memoirs I was impressed with “Sorrows & Songs, One Lifetime – Many Lives” by Janice Wood Wetzel, not just because of her life, but also because of how she chose to share it with readers like me. She starts in the early 1930s when she was a little girl and takes the reader through the journey of a woman through the 20th century and into the 21st Century. Her heart wrenching, and even traumatizing experiences contrast with her strong will, infinite courage, and amazing accomplishments. Yet, her vulnerability is what will get the reader. From a difficult childhood under alcoholic parents, being a depression patient who undergoes electroshock treatments, to the search of self-identity and love, Janice opens her life for all women, inviting them to peek inside and get inspired by this vignette style memoir. Wetzel’s voice comes across loud and clear through her candid narrative prose within each vignette. The words flow almost like a melody, each one giving the reader a punch line…a message. Her writing style and choice of formatting is very clever and effective. I found myself not only learning from her experiences, but also relating and enjoying each one as standalone stories as much as parts of a whole book. As a woman traveling my own journey, I appreciate the candidness and could relate to many of the things she had to face during such evolving times for women. I just wish the format was a little more entertaining in order to hook younger crowds into such an amazing and inspiring journey. “Sorrows & Songs, One Lifetime – Many Lives” by Janice Wood Wetzel should definitely be read by women in all stages of their lives, and those men who are wise enough to learn more about what it is like to be a woman.